Why aren't people calling/emailing for an appointment? Why won't "doctors" refer patients to me? Who Do I ask for new patients? There are lots of reasons people don't contact you for an appointment. 1) They don't understand that not all physical therapy is the same. 2) They don't know that what you provide is a higher quality service or better value than what they get down the street. 3) They don't know you even exist. Never wait for the phone to ring. 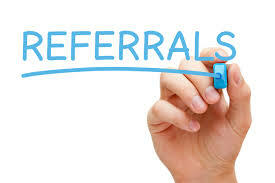 Please don't ask for referrals. It's time to shift your mindset from waiting for others to send patients to you and to start providing something of value to your community. You give your knowledge to others by creating educational programs and providing valuable resources such as newsletters and instructional videos. When you position yourself as the expert in your community by creating something of value that helps your "referral partners," potential patients will begin to seek out your advice and services when they need need help, are hurt or injured. Here are my Top 10 Strategies to Get New Patients. 1. Be Yourself. 'nuff said. 2. Get to know people - Be social. People who know, like and trust you (and know what you do) will tell others about you. 3. Workout with People - when you workout and exercise with a trainer, friends or in a group class, people around you will come to you for your knowledge, expertise and become patients. Walk the walk. 4. Get Results. When you get results faster than the alternative, patients will tell people about you and your practice. 5. Create an Awesome Website - Your website should be more than your online brochure. It should capture the attention of potential patients and show them how they will feel and what they will experience in your practice. 7. Testimonials - Directly ask your patients for a testimonial. Most patients would love to write a testimonial for you, they just don't know you want one. Implement just one of these tips each week for the next 10 weeks and you'll start to see the world around you change. What have you been focusing on lately to get new patients to contact you for an appointment? *Interested in starting a cash-based practice? Get your Free CashPT Checklist Here.